Lindey takes Astreya, Cam, Damon, and Arneb to Matris, only to discover that much has changed since she left home. Suspicion and distrust surround the men. Astreya and Lindey begin to resolve their difficulties, but a gossipy old man on a horse misrepresents the past, and all five must flee aboard Arneb's boat. Once outside the shelter of the hills surrounding Matris, the group discovers that the bloodthirsty Men of the Sea are searching for their navigation stones, and they think the Village where Astreya was born has them. 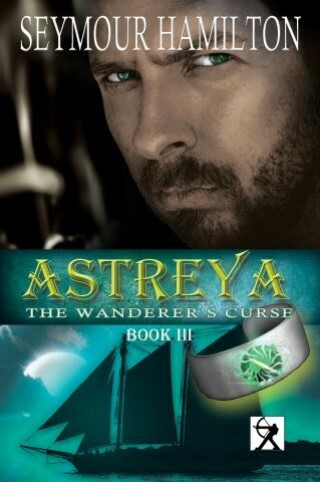 Astreya must arrive in time to avert a massacre. When the great black ship reaches the headlands of the fjord, Astreya must confront the worst and the best aspects of his inheritance before he can unravel his past and lift The Wanderer's Curse. …keeps the suspense going as the many mysteries surrounding the back history of the characters are revealed to bring the series to its final conclusion. …so rich and deep and intricately imagined… Hamilton has continued, expanded and masterfully completed the complex and hauntingly beautiful tapestry… A great ending to a great story, by a great story-teller. Seymour Hamilton was born in England in 1941. His father was a British naval officer, his mother a New Zealand singer.They moved to Ottawa, Canada in 1949. It took a long time until Seymour Hamilton could legitimately call himself a fiction writer, although he remembers wanting to do so when he was about 12 years old.